Our Martingale Dog Collars are not only made to the highest standards but also boast unique and attractive designs to make sure your pooch stands out. Perfect for training a pup, our Martingale Collars are also the ideal solution for dogs that back out of their collars or pull too much. Browse our collection below and find yours today. What is more terrifying than the thought of your dog getting away from you? A pleasant afternoon stroll can turn into your worst nightmare in an instant when your dog pulls out of her collar or harness. Whether you have just adopted a new dog, are choosing the right tools to walk your puppy, or have had problems with your dog slipping out of her collar or harness, you need a safe, secure way to walk your dog. Trainers and animal rescues recommend martingale collars because they are the safest, most secure choice available. What is a Martingale Collar and their Benefits? What about Buckle, Slip, Choke, and Pinch Collars? This limited-slip collar was originally marketed for sighthounds because their narrow heads slipped easily out of regular collars. Furthermore, their delicate, slender necks were easily injured by choke collars. The tightening action of a martingale collar evenly distributes pressure around the neck, preventing both injury and escape. This is why these collars are the best choice for anyone who wants to protect their dog from injury while protecting against escape. The control loop of a martingale collar is either made of the same fabric as the main collar or it is made of a metal chain. It is better to choose a loop of the same fabric since there is no risk of this getting snagged in your dog's coat or discoloring your dog's fur. Furthermore, fabric does not make a snapping noise when it is pulled like chain does. Some dogs may be startled by the sound. Standard Martingales vs Buckle Martingales? The standard martingale is a collar without a buckle. This style must be adjusted large enough to be slipped over the dog’s head then adjusted once on for proper fit. This lightweight design is a good choice for smaller dogs that you do not want carrying the added weight of a buckle and durable enough for strong pullers. The buckle martingale was made with convenience in mind, with a quick release buckle (made from metal or strong plastic) for added safety, and ease of removal. This style is an excellent choice for dogs with large heads or does not like their ears being touched. Martingales with buckles are also preferable for any dog that tends to be skittish since they don’t require you to pull something over the head. Plastic - Plastic buckles are lightweight, durable, waterproof, and generally more affordable than other options. Great for fresh or saltwater. Metal & Plastic (hybrid) - Buckles made of both metal and plastic offer a combination of light weight, good looks, and strength. Not recommended for saltwater use. Aluminum - Aluminum buckles are heavy-duty choices that are good for large dogs and dogs that pull strongly. They are also popular for small dogs but you must consider the added weight before purchasing. Not recommended for saltwater use. You can eliminate the jingle of traditional tags by having the buckle on your new martingale collar personalized. Safer than wearing traditional ID tags that can become hooked or caught while your dog is running or playing. Save money on not having to re-order lost dog tags. Less bulky for small dogs to wear. For a collar to be safe, function appropriately, and looks its best, it needs to fit properly. Step 1 - Measure Dog's Neck: Using a soft tape (seamstress tape) measure around your dog’s neck where their collar naturally sits. Pull the tape until it is snug but not tight. You should be able to comfortably put two fingers between the measuring tape and your dog's neck. Record your measurement. If you do not have a soft tape, use a piece of string and measure around your dog’s neck using the above instructions. Take the string and lay it flat on a smooth surface and use a ruler or tape measure to obtain the measurement. Step 2 - Measure Dog's Head: If you are ordering a standard martingale (without a buckle) the collar will need to be large enough to fit the neck, but also large enough to fit over the head and ears. Using the same method from step 1, measure the head starting at the throat and going around the head, including the ears. Record the measurements and use while determining the correct size collar to order. Additional information is available in this dog collar sizing guide. In order to ensure a perfect fit it‘s recommended to order a custom fitted martingale collar. Custom sized martingale collars are typically made with your dog’s neck size at the center position allowing the collar to go smaller or larger in size. The smaller the collar the less amount of adjustability when compared to large collars. Ordering a custom sized collar gives you the most adjustability for smaller dogs. Custom sizing allows you to purchase a collar slightly larger than needed, while still fitting now, allowing your dog to grow into the collar. Generally speaking, you would select a smaller width for a smaller dog, and thicker width for bigger dogs. A wider collar will distribute the pressure across a larger area of your dog’s neck making it more comfortable. There is no right or wrong answer but think small, medium and large in relation to the size of your dog and the width of the best size collar to order. Strong dogs, heavy pullers or dogs bordering on the next size up you may want to select a wider collar. ¾” may be appropriate for very small dogs. 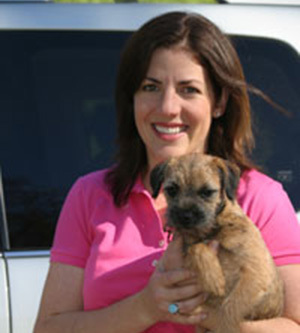 1” is right for medium-sized and larger dogs and is the most common size for most dogs. Medium and larger dogs or dogs with long, delicate necks may benefit from a width of 1.5” or more. There are two different adjustments for martingale collars that you should be aware of. The collar should be loosened off in case the control loop was to ever get caught on something to prevent accidental strangulation. The two slides on the control loop should easily touch. The collar should sit comfortably, roughly mid neck once on. It will be looser than a flat collar. You should easily be able to slide your entire hand under the collar to grab it. For safety, some professionals recommend only using a martingale collar under supervision during walking or training and removing it when not in active use. Please note that martingales are not suitable for use with retractable leashes or for tying out. To set the adjustment, pull the collar up to the top of the neck, so it is sitting just behind the ears. To ensure a good fit, you want to adjust it to be snug here, as this is the smallest part of the neck (before going over the head). This will prevent your dog from being able to slip out of the collar. Once tension is relieved from the collar it should sit comfortably mid-neck and be slightly looser fitting than a flat collar. When in this location, leash attached, and pulled tight the hardware on the control loop should never touch! There should always be two fingers width (about 2”) between the hardware. The control loop on the collar should have enough slack to pull into a symmetrical triangular shape when a leash is attached and pulled. If the hardware at the base of the loop is touching, your collar is too loose. It will form a sharp triangle. If the loop is lying flat against the dog’s neck or forming a flat triangle, the collar is too tight. It is important that your dog not lean into the collar and consistently pull. Martingales are designed to tighten when necessary and relax most of the time. When your dog pulls, gently pull back. Stop walking if necessary. As soon as your dog releases the pressure continue on walking. Your dog will quickly learn not to put pressure on the collar. If you find your dog pulls constantly we recommend seeking the assistance of a trained professional to help you with some basic loose leash walking skills and training for your dog. Not for Unsupervised Use - Martingales should not be left on your dog when you aren’t supervising her, since they can be snagged and pulled off or pulled tight on your dog. Not for Sole Restraint for Constant Pullers - Dogs that constantly pull against the leash should have a harness to restrain them in addition to the martingale. Not for Off leash Play Outside - Because martingale collars sit looser on a dog's neck than buckle collars, they may be more easily snagged when a dog is playing with other dogs or moving through plants or shrubbery. For this reason, after your walk to the dog park, it is best that you clip on a buckle collar with ID tags. Not for Retractable Leashes - The constant tension from retractable leashes can tighten the martingale collar inappropriately and make it difficult for your dog to understand whether she is pulling too hard or not. Not for Tethering or Tie Out - Martingale collars should never be used to tether your dog to an object, even for an instant. Always be within reach of your dog's leash when she is wearing a martingale collar. Remove when Crating - When your dog goes in her crate, her collar should come off. The collar could get snagged on a part of the crate or your dog could even get a paw through it. Pet Tag Location: Pet tags should never but hung from the d-ring on the short loop of a martingale collar for safety reasons. Tags should be hung from the slides or an optional extra d-ring. Dogs can wiggle out of body harnesses of any type. A harness that seems to be well-fitted may still allow room for a dog to get a leg through without you noticing, causing the harness to fail when your dog pulls. If your dog wears a head harness like a gentle leader, she may be able to get a paw up and wipe off the muzzle part and slide out of the collar part. This can happen surprisingly quickly. Buckle collars are fine for carrying your dog's ID tags, but it is very easy for a dog to back out of a buckle collar, even if it is fit very tightly. You may think that there is no way that your dog could pull her head out of a tightly buckled collar, but you will be amazed by how hard your dog might be able to pull when she puts her mind to it. She may not care if the collar hurts her neck or ears while she pulls her head out. Slip and choke collars allow the collar to tighten indefinitely. This means that the harder your dog pulls, the tighter it will get. If a slip collar is pulled sharply either to discipline a dog or to pull her back from a sudden obstacle, it can tighten quickly and significantly enough to injure or dog or cause significant pain. If your dog lunges after something on a slip collar, she could injure the delicate structure of her trachea. The Professional Pet Guild recommends against these collars because, in their experience, these collars result in soft tissue injuries and damage the human-animal bond. Pinch or prong collars are designed to tighten to a specific degree around your dog's neck, pinching the skin between the prongs of the collar and creating a sharp pinching sensation. These collars are only used in training programs that use punishment an adverse of training (Positively.com). Modern trainers agree that such collars are not only dangerous to your dogs throat but often result in adverse behavioral consequences. Dogs are likely to become more fearful and aggressive when such techniques are used, even if the behavior at the moment appears to be suppressed. Numerous studies point to the negative consequences of prong and pinch collars and negative reinforcement training. One study found that dogs trained with negative reinforcement-based methods like prong and choke collars showed signals of stress and lowered body postures when displaying the behaviors they had been trained to perform. Contrastingly, the dogs trained with positive reinforcement were more attentive to their owner and didn’t show these stress signs. Keep your dog safe, without any annoying jingling pet tags! 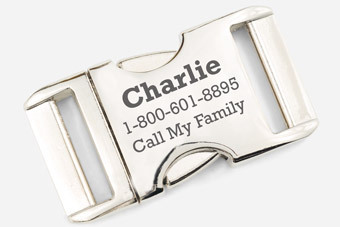 Add your dog’s contact information and name to the buckle for safety. 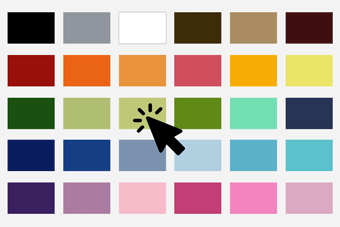 You have your favorite colors, whether it’s a sports team, a holiday, or just your own personality. Now, your dog can wear that same style too! Your dog can have a perfectly fitting collar with no extra charge. Just choose ‘custom sized’ when you check out to ensure the collar is cut to the right fit. "The main reason I chose If It Barks is their martingale collars and the effectiveness in teaching leash training. The collars add control and do not allow dogs to back out. The way the collars fit on a dog, when done correctly, distributes pressure around the entire neck and avoids simply putting pressure on the trachea like a typical dog collar. So, for health and safety reasons, these collars are the best. I use If It Barks collars for all 5 of my dogs"
Looking for martingale dog collars that colorful, vibrant and stylish and also functional? Martingale dog collars from If It Barks are the perfect solution! Martingale collars are a style of collar that allows for more control than a regular “flat” collar. Add in colors that really pop and you have style that meets functionality! It can help prevent hair knotting around the collar area on long haired dogs due to a slightly looser fit around the neck. If you would like something a little more custom, you can create personalized martingale dog collars. If It Barks martingale collars are available in striped, webbing and hemp. Our personalized martingale dog collars materials are sourced in the USA and each product is hand-sewn in North Carolina by our seamstresses. To learn more about martingale dog collars, click here.